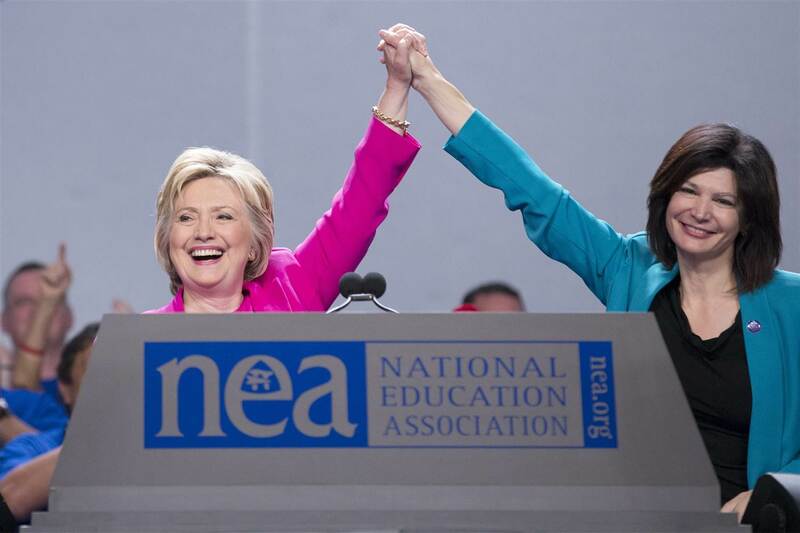 Writer Dana Goldstein is highly impressed by Hillary's talking points at the NEA. She says it represents a new beginning for teachers, and calls her "the teachers' candidate." Yet she's also highly impressed by recent actions of the Obama administration. Former Secretary of Education Arne Duncan issued a mea culpa of sorts on the overuse of standardized testing, and his successor John King has drawn attention to racial segregation and overly harsh school discipline. While it's nice that these guys have finally taken the crucial step of paying valuable lip service to these things, the fact is they've done jack squat on the testing front, and John King is, in fact, trying to subvert ESSA to ensure that more testing be done, spirit and letter of the law be damned. And despite the alleged philosophical evolution of President Obama, I haven't heard him raise a peep over King's disregard for the law. Obama wasn’t wrong about the excesses of teacher tenure. I love that Goldstein feels no pressure to, you know, offer any evidence for that statement. In fact, tenure does not give teachers jobs for life. Tenure just means, or at least used to mean, that admin has to prove teachers are unfit before they fire them. Generally no one, including Goldstein, questions why these teachers received tenure if they were indeed unfit. And no one questions why administrators didn't bother to go after these teachers before. But now that Cuomo has managed to place the burden of proof on teachers to prove they are not unfit, a virtually impossible burden, perhaps writers like Goldstein find things improved. Who knows? She herself feels no need to even offer an explanation. I wrote a book on our historical tendency to blame teachers for society’s ills. Teacher accountability isn’t a bad thing; any functional system has mechanisms in place to remove low performers and, even more importantly, help them improve. Despite the fact that Hillary was addressing an audience of teachers and clearly catered her remarks to evoke applause, despite the fact that this was a speech, not an act, and despite the fact that teachers booed her remarks about charters, which she clearly plans to support and expand, this writer, who "wrote a book," is certain it's a new day. Frankly, I didn't even see how Hillary's promise of "a seat at the table" has any meaning whatsoever. I've been to many legally imposed public meetings where those who were supposed to listen had their minds made up and did whatever they came to do anyway. I've joined entire communities to speak at that table as Bloomberg's operatives played video games below it, ignoring us entirely. If Hillary becomes President, it's incumbent upon activists like us and opt-out to keep the pressure on. We already know that AFT and NEA are content with status quo and unconditionally accept every word that comes out of the mouths of educational demagogues they wish to support. It's what they do, not what they say, and thus far Hillary Clinton has done nothing but sit idly by while her former boss followed each and every reformy druther of Bill Gates. She's accepted money and support from Broad and the Walmart family, and this teacher does not believe reformies are paying for any "new beginning" that involves improving the lot of public school teachers or students. Go ahead and prove me wrong, Hillary. But don't take me for such a fool that, after decades of reforminess, I should just take your word things will be better even as you offer no specifics whatsoever.